On the 7 day Best of Tanzania Lodge Safari you will visit Tarangire and Lake Manyara National Park and of course the world famous Serengeti and the Ngorongoro Crater. This safari was designed for those who prefer a bit more comfort while traveling around Africa. Clients overnight in comfortable lodges. Have a look at the "How things work" section to get a better idea of what to expect. We travel through breathtaking landscapes on "adventurous" roads while you experience nature, wildlife and the African way of life. Click on the map to enlarge. Included: Transportation in a 4×4 safari vehicle, Professional, English-speaking guide (or German - see dates), Meals according to the itinerary, Mineral water, Overnight stays in safari lodges and tented camps as per the itinerary, All national park fees, All mentioned activities, Flying Doctors insurance (AMREF) during the safari. Excluded: Flights, Optional activities, Alcoholic and soft drinks, Visa fees, Tips, Personal spending money for souvenirs etc., Travel insurance. We begin our Tanzania Lodge Safari once you are picked up at your hotel. It will be about a 2 hour drive before you arrive at the Tarangire National Park. Giant baobab trees, bush savannah and the seasonal marshes add to the wonder of this nature reserve. Tarangire National Park is considered as one of the best places to view elephants up close, not only because there are thousands of animals, but also because they are not disturbed by the presence of vehicles. The park is also home to buffaloes, zebras and wildebeests which are always closely followed by a variety of predators such as lions. Leopards are seen every now and then and cheetahs are rarely spotted. From the open roof of the safari vehicle you will be able to absorb the landscape and watch the animals. In the late afternoon you will leave the park and drive to the Lake Burunge Tented Camp, where you will overnight. After breakfast you will travel to Lake Manyara National Park. The park is known for its over 400 bird species, primate-filled forests and grassy plains. A large area of the park is covered by the alkaline Lake Manyara, the seasonal breeding grounds for large colonies of flamingos and many more waterbirds. The park is also home to giraffes, hippos, wildebeests, impalas and groups of noisy monkeys and baboons. After an extensive game drive (safari) you will travel to the Kirurumu Manyara Lodge, where you will spend the night. After breakfast you will travel via the cooler highlands towards the southern Serengeti and around midday you will reach the plains of the Serengeti National Park. This park is the largest in Tanzania and has a diversity of habitats and landscapes – short grass plains, savannah, thick bush, swamps and lakes. Bizarre rock formations called "koppies" dot the grassy landscape where predators are often seen. The Serengeti is famous for the yearly migration when hundreds of thousands of wildebeests and zebras trek to find fresh grass and water. Depending on the season, you will either spend the night at the Kati Kati Tented Camp inside the park or at the Mapito Tented Camp on the outskirts of the park. The entire day is dedicated to game viewing (safari) in the Serengeti National Park. The areas that you visit will depend upon where the migrating herds are. Predators usually follow closely behind the trekking animals and include lions, leopards (in the acacia trees) and cheetahs. During the short rainy season in November and December the herds move from the hills in the north to the plains in the south. During the longer rainy season from April to June they return up north. As the migration is completely dependent on the yearly rainfalls, the location of the herds may vary from year to year but your guide will know where to locate the animals and where to see them best. You will spend another night at previous night’s camp. 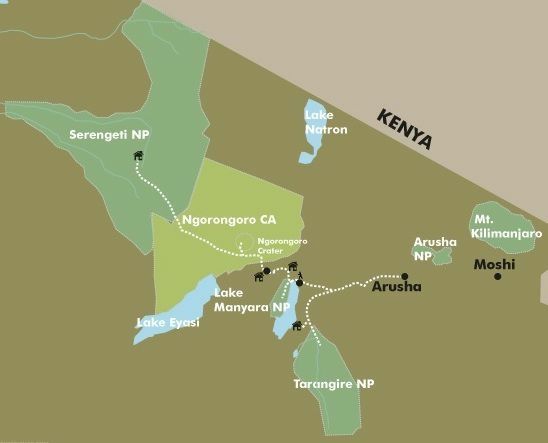 On your outward journey to the park gate, you will enjoy some more game viewing before you leave the Serengeti National Park in the early afternoon to continue your journey to the Ngorongoro Conservation Area. As soon as you reach the edge of the Ngorongoro Crater, you will see the giant caldera below – a breath-taking view. You will leave the Ngorongoro Conservation Area and drive to the Ngorongoro Farm House in Karatu, where you will join a walk in the coffee plantation to learn more about the cultivation and processing of coffee. You will spend the night at the Ngorongoro Farm House. After an early breakfast at daybreak you travel back to the Ngorongoro Conservation Area before you drive down into the crater. The massive collapsed volcano is home to over 25,000 mammals ranging from the “Big Five” - lion, elephant, buffalo, rhino and leopard to spotted hyenas, rare wild dogs and some of the more than 500 bird species of the area. After an extensive game drive (safari) and a picnic for lunch, you will leave the caldera in the afternoon and return to the Ngorongoro Farm House to spend another night. After a leisurely breakfast, you will travel back to Arusha where you will arrive around midday. You will be dropped off at a hotel of your choice or at the airport. The African View Lodge is a stone’s throw away from Arusha National Park at an altitude of almost 1400m. The cosy bungalows at the lodge serve as an ideal starting point for safaris departing to the world-famous Ngorongoro Crater, the Serengeti, Tarangire and Lake Manyara National Parks.